Families, consumers, and vendors have many questions regarding the regional center system, Westside Regional Center services and the provision of services. We have collected some of the most frequently asked questions and provided answers to assist you. Q: A Developmental Disability: What is it? Developmental disabilities include intellectual disability, epilepsy, cerebral palsy, autism, and conditions that require treatment similar to that provided to persons with intellectual disability if the onset was prior to age 18 and is substantially handicapping. Autism usually appears during the first three years of life. It is characterized by impairment in three areas: social interaction, verbal and nonverbal communication, and range of activities and interests. Difficulty with social interaction may be shown, for example, by failure to cuddle, indifference or resistance to affection or physical contact, and/or lack of eye contact. Sometimes parents mistakenly suspect that the infant or young child is deaf. Impairment in communication may include absent or delayed language, echolaic language in which the person is only able to repeat what is said to him or her, little or delayed use of gestures or facial expressions to communicate, and/or unusual speech inflection such as a monotone. In the younger child, a restricted range of interests and activities may show itself in an attachment to just a few objects such as a string or rubber band. The child may have repetitive bodily actions such as incessant hand movements, rocking back and forth, or repeated words. There may be strong reactions to small changes in the environment. The older child may insist on following routines in a precise way and have a low tolerance for frustration. Cerebral palsy is a disorder of posture and movement due to a dysfunction of the brain. In some instances, the cause of cerebral palsy can be identified, such as central nervous system infection or bleeding, head injury, certain birth defects, or insufficient delivery of oxygen to the brain of the fetus or newborn. In many instances, however, the cause is not known. Cerebral palsy can be characterized by stiff and difficult movement, involuntary movement, balance problems, poor body tone, or a combination of these. It can affect all four extremities (quadriplegia), the lower extremities on one side only (hemiplegia), or the lower extremities only (paraplegia). Speech problems may also be present. Epilepsy is caused by a sudden, brief change in the brain’s electrical activity. When brain cells are not working properly, actions, movement, or consciousness may be altered for a short time. In medical terms, these physical changes are called epilepsy, or recurrent seizures. Some people can experience a seizure and not have epilepsy. For example, children may have convulsions from high fevers; this type of seizure is called a febrile convulsion. Other types of seizures not classified as epilepsy include those caused by an imbalance of body fluids or chemicals, or by alcohol or drug withdrawal. Seizures of this nature can, in certain instances, develop into epilepsy if they continue to recur in the absence of the initial cause. Seizures can be generalized, meaning that all brain cells are involved. One type of generalized seizure consists of a convulsion with a complete loss of consciousness. Partial seizures occur when a smaller portion of the brain is affected. Q: What is a High-Risk Infant? We also provide services to children up to three years of age who are at high risk of a developmental disability. These services can often help prevent or lessen the effects of a long-term disability. Delay in one or more developmental areas. Medical issues or complications such as severe breathing problems, central nervous system infection or bleeding, low birth weight, prematurity, birth defects, failure to thrive, and exposure to toxic chemicals or drugs during pregnancy. Q: What is an Intellectual Disability? Intellectual Disability was formerly referred to as Mental Retardation. The term mental retardation is no longer used. Individuals with intellectual disability develop at a slower rate than their peers and experience some unique challenges in the areas of learning, social adjustment, and independent living skills. Individuals with intellectual disability require the same basic services that all people need for normal development. These services include education, vocational preparation, health services, recreation, and emotional support. Like all individuals, people with intellectual disabilities require a supportive family and/or social network for optimal development. Intellectual disability includes a very wide range of abilities. 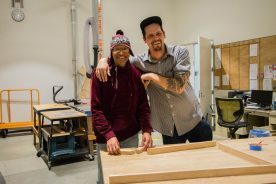 Some individuals can develop the vocational and social skills necessary for their own support, while others may remain fully dependent upon others to satisfy their daily needs. Q: What services can WRC provide? Q: What is a Service Coordinator/Counselor? The Service Coordinator/Counselor is responsible for collecting and giving information to the consumers and families, coordinating services for the consumers and families to enable them to have a leadership role in service design, and advocating for consumer rights. The Service coordinator assures that the Individual Program Plan and Person Centered Plan is successfully implemented. Service coordination is essential to assuring that consumers and families are assisted in securing services and supports which maximize opportunities and choices in living, working, learning, and participating in recreation in the community. The primary direct service provided by the regional center is service coordination. A service coordinator/counselor is assigned to each consumer and family. Q: What Happens Once I Am Assigned to a Service Coordinator/Counselor? The service coordinator/counselor assesses the client’s current situation by interviewing to client, the consumer’s parents and other family members, advocates and service providers. The purpose of gathering information and conduct evaluations in order to develop a Person-Centered Plan for the person with the developmental disability. Q: What is a Person-Centered Plan? 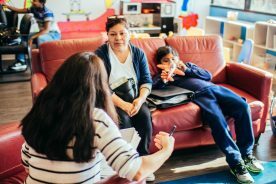 The regional center client helps to develop the Person-Centered Plan with their circle of support, which may include a wide circle of relatives and friends, parents, and the service coordinator/counselor. The Person-Centered Plan is based on hopes and dreams for the future as well as an assessment of the person’s needs, preferences and life choices, the Person-Centered Plan states specific objectives to develop competencies and achieve personal goals in the areas of community participation, housing, work, school and leisure time. When children with developmental disabilities live with their families, the plan includes a special section describing those services and supports necessary to maintain the child at home. Q: I want to get involved with Self-Advocacy. How do I do that? You can speak with your service coordinator about self-advocacy groups in your neighborhood. You can also call Kecia Weller, Coordinator of Consumer Advocacy, at (310) 258-4111. Either your counselor or Kecia will be able to suggest various ways you can get involved with self-advocacy. Your options include joining the Consumer Advisory Committee, a community Self-Advocacy group, starting your own Self-Advocacy group, writing articles for the Speak For Yourself newsletter, and many other activities. Q: What should I do if I have problems with the services I am receiving? First, talk with the Service Provider to see if you can resolve the problem with them. If that does not resolve the problem, then contact your Service Coordinator at Westside Regional Center to discuss the problem with him/her. If talking with your Service Coordinator does not resolve the problem, then contact the Service Coordinator’s supervisor. Call (310) 258-4000; tell the receptionist that you need to talk with your Service Coordinator’s supervisor. Q: How do I change my Independent Living Skills program or Day Program provider? Inform your Service Coordinator that you what to change your Service Providers, tell him/her what Service Provider you want to transferred to, if you know this already. Your Service Coordinator will arrange for you. Q: What should I do if I am unhappy with my Service Coordinator and I want to switch to another Service Coordinator? Inform your current Service Coordinator or his/her supervisor that you want to change Service Coordinators. Your Service Coordinator will transfer your case to another of Westside Regional Center’s helpful Service Coordinators. Q: What do I do if my Service Coordinator doesn’t returns my telephone calls? Call (310) 258-4000; tell the receptionist that you need to talk with your Service Coordinator’s supervisor. Q: What should I do if I have an emergency and cannot reach my Service Provider? During the business hours of 8:00 AM to 5:00 PM call the Westside Regional Center at (310) 258-4000 and ask for the Counselor of the Day. The Counselor of the Day will assist you with your emergency. During evenings and weekends, call (310) 258-4000; tell the answering service that you want to contact the Supervisor on Call. The Supervisor on Call will assist you with your emergency. Q: How is the Regional Center funded? The State of California has a commitment to provide services and supports to individuals with developmental disabilities throughout their lifetime. These services and supports are provided through a combination of federal, state, county and local government services, private businesses, support groups and volunteers. The Department of Developmental Services (DDS) provides leadership and funding for these services and supports through state-operated developmental centers and contracts with twenty-one agencies called regional centers. The regional centers have offices throughout California to provide a local resource to help find and access the many services available to individuals with developmental disabilities and their families. There is no charge for diagnosis and assessment for eligibility. Once eligibility is determined, most services are free regardless of age or income. There is a requirement for parents to share the cost of 24-hour out-of-home placements for children under age 18. This share depends on the parents’ ability to pay. There may also be a co-payment requirement for other selected services. Regional centers are required by law to provide services in the most cost-effective way possible. They must use all other resources, including generic resources, before using any regional center funds. A generic resource is a service provided by an agency that has a legal responsibility to provide services to the general public and receives public funds for providing those services. Some generic agencies you might be referred to are the local school district, county social services department, Medi-Cal, Social Security Administration, Department of Rehabilitation and others. Other resources may include natural supports. This is help that you may get from family, friends or others at little or no cost. Q: How much does it cost to go the Regional Center? Regional Center services are free of cost. Initial evaluations to determine eligibility can be paid for by the Regional Center or Medi-Cal. Q: Do I need to meet a financial requirement in order to be considered for eligibility? No, the Regional Center system does not require a specific income level. Eligibility is determined based on diagnosis and need of each consumer only. Q: If my child has already been assessed, may I submit the report for eligibility? Yes, records can be submitted to the Intake Unit for review. At times, outside reports can be used in place of a Regional Center evaluation during the intake process. Reports should be submitted to the Intake Counselor and reviewed by the Interdisciplinary Team prior to waving any Regional Center evaluations. Q: Do I need to be a U.S. citizen to get Regional Center services? Q: What if my Son/ Daughter keeps refusing to attend Regional Center meetings? If you child is under the age of 18, and you are his/her legal guardian, you may sign the Agreement and Consent Forms. In addition, you may arrange for and accompany your child to meetings with your Regional Center Service Coordinator. If your child is an adult, and over the age of 18, you may not sign documents for them or arrange meetings with Regional Center personnel without their permission. If you are the conservator for this adult, you may provide Regional Center with documentation verifying your status, and participate in the Regional Center process. Q: How long will my child be eligible for WRC services? Unless otherwise stated at the time your child’s eligibility is determined, your child will remain eligible for Regional Center services as long as he/she chooses to accept them. If a consumer decides not to remain active with the Regional Center, his/her case will be inactivated. If, a case becomes inactivated for a number of years, eligibility must be redetermined before the case is reopened. Q: Why are services different if my child is under 3 years old? Services for children under Early Start eligibility, birth to three, are different from services provided to Regional Center consumers age three and above. At the age of three, your child becomes eligible for special education services from your local school district. Prior to the age of three, Early Start programs are the primary providers of intervention services for your child. Eligibility for Regional Center services is determined at age three. Prior to age three, eligibility is determined by Early Start guidelines. All children eligible for Early Start services are only eligible until their third birthday. Prior to turning three years of age, each child will be evaluated and continuing eligibility for Regional Center services will be determined. If you are eligible for Regional Center and you move out of WRC’s catchment area, please inform your Service Coordinator immediately. If you remain living in California, your case will be transferred to 1 of 21 Regional Centers that encompasses your new residence. Q: Who can access Regional Center records? Regional Center records are only released with permission from the consumer or legal guardian. Our records are confidential. Q: Why do other children have different services than my child? Services provided by the Regional Center are based on the individual needs of the particular consumer. It may be that another child requires a particular service that your child may not require, or it may be that your child is similar to this child and you need to inquire about this service from your Service Coordinator. There are many services in our community and new programs are growing everyday, please continue to inform your Service Coordinator of new services that they may not yet know about. This will help us to increase our knowledge and inform other families of new services as well. Q: Why doesn’t the Regional Center pay for a tutor for my child? Regional Center does not pay for anything deemed as education for your child. Your Service Coordinator will assist you with programming from your local school district at your request, in order to provide an educational program that is appropriate for your child. Q: Can I be reimbursed from the Regional Center for programs that I paid for before being referred to WRC? No, all services funded by the Regional Center must be documented on the Individual Program Plan (IPP). In addition, a consumer is not eligible for funding until the intake process has been completed, and the consumer is found eligible for Regional Center services. Referrals for intake can be made by parents, legal guardians or conservators. People can refer themselves to the Regional Center if they are 18 years or older. Professionals and concerned persons may make a referral, however, permission of the individual, parent or legal guardian is necessary. Legally ordered evaluations may come from the courts or Department of Children and Family Services. Once the referral is accepted, the applicant will meet with a Westside Regional Center Intake Counselor to begin gathering background information. This information will include health and developmental history as well as information provided by family members. At this time, the intake process will be explained, including services that may be available if the applicant is found eligible. Psychological testing may be completed by Westside Regional Center to determine if the applicant has an eligible diagnosis. Recent evaluations attained in the community may be presented for review, and at times may be used instead of re-evaluation at WRC. Recent medical information concerning each applicant is needed. Medical records and physician’s assessments will be requested. These records will be reviewed and possibly used in place of a WRC assessment. The applicant may be evaluated by a Westside Regional Center physician. A multidisciplinary team meets to review all gathered information. This team determines if the applicant meets the criteria for eligibility. If the applicant is found eligible, a meeting is held with all concerned parties to develop a Person Centered Plan. If the applicant is not eligible, appropriate community referrals and recommendations are made and our appeal procedures explained. Q: What if I don’t like the program that we developed for my child? Do I have to wait until the end of year to change it? No, please contact your Service Coordinator if you are unhappy with your current Individual Service Plan. Your plan can be modified and added to at any time, at your request. This is also applicable if you are unhappy with the provider of the service. Q: Who do I call if I can’t contact my Service Coordinator? If your Service Coordinator is on vacation, or unavailable, feel free to leave a message and your call will be returned as soon as that person is able to. If you are calling due to an emergency or your call is not returned, please call the Regional Center and request to speak to the Counselor of the Day. Please make sure to give the receptionist the age of the consumer so that the call can be routed appropriately. Each unit has a Program Manager that you may call as well. Q: Does the Regional Center place my child in a school program? No, the Regional Center will make a referral to your local school district and assist you in the process of locating an appropriate program for your child, but we do not provide school programs. Q: Is the Regional Center a program that an adult can go to everyday? No, the Regional Center provides Service Coordination for consumers. We vendor programs that provide direct services at locations within our community. service that you want to contact the Supervisor on Call. The Supervisor on Call will assist you with your emergency. Q: What is the billing process? In order to provide services to WRC consumers you must be an approved vendor. Regional center staff, in cooperation with the consumer and family, determines at regularly specified intervals those services, which are requires by the by the consumer. The need for a service must be identifies in the consumer’s Individualized Program Plan (IPP) before it can be purchased. When the service you provide is needed, consumers will be referred to you. The service will be authorized in advance by the referring regional center. Please remember that once you are vendored you should not provide any service for a regional center without written authorization for payment from the regional center. When the service is authorized WRC accounting department will mail a billing form and an attendance/time sheet. The attendance/time sheet must accompany all signed billing forms (invoices) and be submitted to the accounting department for payment within the deadlines to insure your payment is processed in a timely manner. Q: Who is required to take the Direct Support Professional Training (DSP)? Anyone working in a community care facility (CCF) licensed by the Community Care Licensing Division, Department of Social Services, and providing direct care to people with developmental disabilities who are regional center consumers, will be required to take the 70 hours of competency based training or pass the applicable competency tests. All direct care staff in Service Level 2,3, and 4 facilities are required to complete the 70-hour training or pass the competency test. The term direct care staff includes all personnel, including administrators, of service level 2,3, or 4 residential facilities providing direct service supervision and special services to consumers. Q: What are funds received from the DSP rate increase to be used for? Increase direct care staff salaries, wages and benefits. Provide coverage while direct care staff are in training classes or taking a training or competency test. Other purposes approved by the Director of the Department of Developmental Services. Q: Does Westside Regional Center fund for services on those holidays? Not for services considered to be a day program. If the program chooses to remain open to service consumers without compensation WRC will fund for transportation. Q: When does the Service Provider Advisory Committee (SPAC) meet? The third Tuesday of every month from 10:30 AM until 1:00 PM at Westside Regional Center in the boardroom. Q: When is a Health Care Summary Recommended? Anticipating or recovering from a medical/surgical procedure. Prescribed 2 or more medications. Special health care needs with regards to Durable Medical Equipment. AAIDD — American Association on Intellectual and Developmental Disabilities was formerly the AAMR (American Association on Mental Retardation). This is a national professional organization of people in the field of intellectual disability/mental retardation. AB — Assembly Bill of the California Legislature. Bills are numbered for identification, e.g., AB3804. Adaptive Behavior — Adjustments an individual has made to function independently at home and in the community. The objective often is to conform to norms of personal behavior. Advocate — A person who supports and represents the rights and interests of another individual in order to ensure the individual’s full legal rights and access to services. The advocate can be a friend, a relative, a Counselor, or any other interested person. Amniocentesis — A medical procedure that tests fluid from the amniotic sac to determine if a fetus has any genetic defects. Westside may purchase this procedure for pregnant women at risk of parenting a child with a developmental disability. ARC — The Arc was formerly known as the Association for Retarded Citizens (ARC). This is a national organization for parents of children with intellectual disabilities. The Arc promotes and protects the human rights of people with intellectual and developmental disabilities and actively supports their full inclusion and participation in the community throughout their lifetimes. The Arc-California, the state organization, has many local chapters, such as the Arc of Los Angeles & Orange County, and the Arc-South Bay. ARCA — Association of Regional Center Agencies. State association for the 21 regional centers. ARCA represents regional centers on statewide policy and contractual and fiscal issues. ARCA also provides a forum for information exchange and education among the centers. assessment identifies the individual’s strengths, abilities, needs, and developmental level. Autism — A developmental disability starting in early childhood characterized, by withdrawal, inadequate social relationships, exceptional object relationships, language disturbances, and monotonously repetitive motor behavior. Baseline Data — Information collected about a behavior (such as frequency and severity) before the start of an intervention program. Data is used to test the effectiveness of the intervention. Behavior — Anything a person does that can be observed and measured. Behavior Management — Techniques designed to influence existing behavior in some predetermined manner. Usually involves replacing maladaptive or problem behaviors with behaviors that are adaptive and appropriate. CARF — Commission on Accreditation of Rehabilitation Facilities. A national organization that reviews workshops and other programs. Certifies that programs meet acceptable standards. CDER — Client Development Evaluation Report. An assessment during the intake process, and at progress reviews to determine developmental and functional levels and progress. Cerebral Palsy (CP) — A developmental disability dating from birth or early infancy, and characterized by disorder of movement and posture. Chaining — The process of combining simple behaviors to form a new complex behavior. For example, turning on a faucet, putting soap on your hands, rinsing them, wiping them on a towel, and turning off the faucet are a series of simple behaviors that make up hand-washing. CDDF — Coastal Developmental Disabilities Foundation. Made up of the Board of Directors of Westside Regional Center, this nonprofit organization contracts with DDS to operate Westside. DCFS — The Department of Children and Family Services in Los Angeles County, which administers all child welfare services. DDS — The Department of Developmental Services. This state agency administers the contracts with each regional center and sets many of the regulatory standards for service. The department also operates state developmental centers. DHS — The Department of Health Services. Responsible for Medi-Cal administration and licensing of healthcare facilities. DRC — Formerly called Protection and Advocacy, Inc. A federally funded agency that advocates for both individuals and systems. Staffed primarily by attorneys and paralegal staff, this agency represents clients who have been deprived of their right to services. DMH — The Department of Mental Health. Responsible for state and local services to the mentally ill. Approves and funds community mental health programs and administers Metropolitan State Hospital in Norwalk. DOE — The Department of Education of the State of California. DPSS — The Department of Public Social Services. 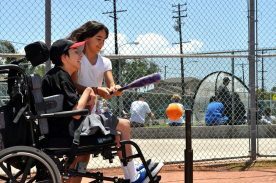 In Los Angeles County, DPSS administers public assistance programs and disability evaluations. DR — The Department of Rehabilitation. Responsible for vocational training and job placement of disabled persons. DSS — The Department of Social Services. Responsible for overseeing the distribution of many government services. License community care facilities. Easterseals – A national organization that provides exceptional services, education, outreach, and advocacy so that people living with autism and other disabilities can live, learn, work and play in our communities. Easterseals has a regional branch in Southern California. ECF — The Exceptional Children’s Foundation. This private, nonprofit parent organization sponsors various infant and adult programs in the Los Angeles area. ELARC — Eastern Los Angeles Regional Center. Epilepsy — A developmental disability involving single or recurring loss of consciousness. Extinction — A behavior management principle. Involves withholding reinforcement until a behavior is gradually weakened. Fading — An instructional strategy. Involves gradually eliminating special assistance (such as physical assistance or modeling) until the client is able to respond independently. FRC — Family Resource Center. 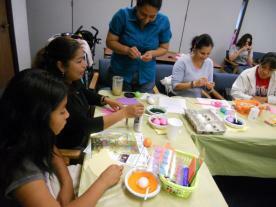 Los Angeles has a regional branch of the Family Resource Center Network. FDLRC — Frank D. Lanterman Regional Center, serving people with developmental disabilities in downtown Los Angeles and the surrounding area. FSH/FDC — Fairview State Hospital. Now called Fairview Developmental Center. Gastrostomy — A surgical procedure that inserts a tube into the stomach for feeding. Generic Services — Services offered or available to the general public, as distinguished from specialized services for specific groups of people. For example, training provided by the Department of Rehabilitation is a generic service available to any California resident in need of rehabilitation. In the absence of a generic service, Westside may purchase that service for its clients. Genetic Counseling — Consultation that focuses on the risk factors involved in parenting a child with a developmental disability. Westside offers this service to a family or individual when a genetic defect is suspected. Genetic Defect — Abnormalities in the genes that cause intellectual disabilities. Goal — A general statement of purpose that defines the end result of a program’s impact on an individual. GR — General relief. A category of public assistance for poverty-level individuals. HRC — Harbor Regional Center. Serves people with developmental disabilities in the South Bay and Beach cities. ICF-DD — Intermediate Care Facility. A residential program for people with developmental disabilities who have medical conditions requiring health professionals on staff at the home. ICF-DD/H — Intermediate Care Facility/Habilitative. Similar to an ICF-DD, but with six or fewer beds, and with an emphasis on training residents to live independently. ICF-DD/N — Intermediate Care Facility/Nursing. Similar to an ICF-DD/H, but serving clients with greater needs for nursing and supervision. IDEA – Individuals with Disabilities Education Act (PL105-17). IEP — Individual Education Plan. A written statement of objectives and plans to achieve those objectives required for every child in a special education school program. IFSP – Individual Family Service Plan. A written statement completed yearly which lists goals and specific objectives in areas important to the consumer. Each objective contains a target date that the objective is to be met and one or more plans designed to reach the objective. ID (Intellectual Disability) — Now referred to as Intellectual Disability. This is a developmental disability involving below-average general intellectual functioning. Originates during the developmental period (before the age of 18) and is associated with impairment in adaptive behavior. IPP/ISP — Individual Program Plan/Individual Support Plan. A written statement of goals and specific objectives in areas important to the client. Each objective contains one or more plans to achieve it and a target date for completion. Informed Consent — The voluntary acceptance of any procedure, program or practice that is performed by another individual. This agreement requires knowledge of possible outcomes, including adverse reactions and alternative procedures to accomplish the same outcome. Lanterman Act — The Lanterman Developmental Disabilities Services Act, legislation that mandated the right of people with developmental disabilities to receive appropriate services. Least Restrictive Alternative — Refers to an intervention or environment, usually a residential or day program setting, that provides care and training with the least amount of intrusion and disruption to the client, as well as the closest approximation of normal patterns of living. For example, a client who has learned many self-help skills and behavior controls would not require a setting or techniques that emphasized close supervision by many staff members. LPS — Lanterman, Petris, Short Act. This act provides for the detention of mentally disabled persons for evaluation and treatment, and the establishment of a conservatorship for a mentally disordered person. LSH/LDC — Lanterman State Hospital. Now called Lanterman Developmental Center. Medi-Cal — California’s version of the federal Medicaid Program that pays medical expenses for public assistance recipients and other low-income persons. Mental Retardation (MR) — This term is no longer used and is now referred to as Intellectual Disability. This is a developmental disability involving below-average general intellectual functioning. Originates during the developmental period (before the age of 18) and is associated with impairment in adaptive behavior. Metro — Metropolitan State Hospital. Hospital in Norwalk for people with mental illnesses. Modeling — An instructional strategy. Teaches skills or behavior through demonstrating the desired outcome. MTU — Medical Treatment Unit. Administers CCS services in school settings for children with physical disabilities. Multidisciplinary Team — A group of persons who have individual areas of professional expertise and/or know the client and his or her skills and behavior. This group develops the IPP. Sometimes referred to as the ID team. NICU — Neonatal Intensive Care Unit. NLACRC — North Los Angeles County Regional Center. Serves people with developmental disabilities in the northern Los Angeles County and San Fernando Valley areas. Nonverbal Communication — Signals and messages from one person to one or more other people through facial expressions, body movements, verbal tone, or posture. Normalization — The use of culturally valued means to establish and maintain personal behaviors, experiences, and characteristics that are equally culturally normative or valued. OMH — Other Multi-Handicapped. An educational classification for children with two or more unrelated handicapping conditions. Objective — A statement of an expected behavior that is related to the achievement of a goal. Observable — One of the requirements in the definition of a behavior. Refers to behaviors that can be seen or heard, rather than emotions or feelings that are inferred to exist. PDF — Program Development Fund. Money from parental reimbursements and some federal funding that is distributed via grants to start new programs throughout the state. PH — Physically handicapped. An education classification for children with physical handicaps. Previously referred to as orthopedically handicapped. PL — Public Law. PL105-17, for example, sets rules for special education. POS — Purchase of Service. Refers to client services that Westside Regional Center buys. When clients need services that are unavailable from generic resources, Westside Counselors may negotiate service contracts with vendors. PT — Physical therapist or therapy. Person-Centered Planning — An approach to planning for the future based on the client and family’s wishes and on the client’s abilities and preferences. Physical Assistance — An instructional strategy whereby a person is physically led through behavior by another person. For example, to teach a person to wash his hands, the instructor puts his or her hands over the person’s hands and completes the behavior. Positive Reinforcement — Anything a person likes that is given after a behavior to increase that behavior. Protection and Advocacy, Inc. — Now called Disability Rights of California. A federally funded agency that advocates for both individuals and systems. Staffed primarily by attorneys and paralegal staff, this agency represents clients who have been deprived of their right to services. Public Law 94-142 — Federal legislation ensuring that all handicapped children have the right to a free and appropriate public education. Reinforcement — Procedures that make the desired behaviors more likely to occur, e.g., praise. SB — A Senate Bill of the California Legislature. SCAN Team — Suspected Consumer Abuse & Neglect team, a team of Westside Regional Center staff established to review allegations of abuse and neglect, and provide resources and supports. SCDD — The State Council on Developmental Disabilities (SCDD) is established by state and federal law as an independent state agency to ensure that people with developmental disabilities and their families receive the services and supports they need. Formerly known as Area Boards, WRC worked closely with Area Board 10 which was one of 13 agencies in the state that oversaw plans for people with developmental disabilities. Duties include advocacy and monitoring of programs. SCLARC — South Central Los Angeles Regional Center. Serves people with developmental disabilities in the center of Los Angeles. SGPRC — San Gabriel/Pomona Regional Center. Serves people with developmental disabilities in the east San Gabriel Valley. Service Provider — Any community agency or professional that provides services purchased by the regional center for its clients. Also known as a Vendor. SNF — Skilled nursing facility. This residential facility aids individuals with considerable medical needs. SSA — Social Security Administration. This Federal agency administers benefits to retired or disabled workers and their surviving dependents. SSI — Supplemental Security Income. These government funds are available to many people with a disability and limited financial resources. State Council on Developmental Disabilities — An agency established by federal law and the Lanterman Act to plan and review activities from a statewide perspective. Suctioning — A procedure that clears mucous to enable proper breathing through a tracheotomy. TANF— Temporary Cash Assistance for Needy Families (TANF) formerly known as AFDC (Aid to Families with Dependent Children). This is an income maintenance program also known as CALworks in California. Task Analysis — The process of breaking down the content of a complex behavior into smaller and more basic components to facilitate learning. Technology Dependent — Term describing people with a chronic disability who need a specific medical device for a life-sustaining body function (such as breathing). These individuals, usually children, require daily, ongoing monitoring by trained personnel. Tracheotomy — A surgical opening into the trachea of the neck for a breathing tube. Vendor — Any community agency or professional that provides services purchased by the regional center for its clients. Also known as a Service Provider. WRC — Westside Regional Center. Westside serves almost 8,000 people with developmental disabilities living in West Los Angeles communities as far south as Gardena and as far north as Malibu and Calabasas.